"These kids need testing strategies to succeed. They have no clue!" "We were told to teach Common Core State Standards but OAKS is based on the old standards!" "We have to retest all of those who didn't pass? Is this under the new formula for growth or for meeting benchmark scores or not?" "But I still have two months left to teach curriculum! They won't know enough of the material to be tested on it!" "We're going to interrupt our high-interest hands-on learning project to have those who didn't meet on the state test, take the test again?! They will get behind and be left out!" "I'm not surprised by the test results of some students; I could have told you they weren't being successful based on my assessments in class. Why waste time with a high-stakes test?" "I feel like such a failure." "Why are the assessments you as a professional teacher not good enough when it comes evaluating the success of your students?" "State testing started today. Ugh." "Those on the outside look at these test results and see failure." "I am not taking time out of teaching to teach test prep." "Have you looked at your data strands?" Imagine what we could be hearing from students and teachers instead such as, "This is such a fun project!" or "I love this science experiment!" or "Enjoy your book!" or "My students and I are having an amazing time learning about math this week!" What version do we want for our kids and teachers? Time to silence the voices of fear, worry, and shame, and instead, replace them with voices of joy, curiosity, and inspiration. 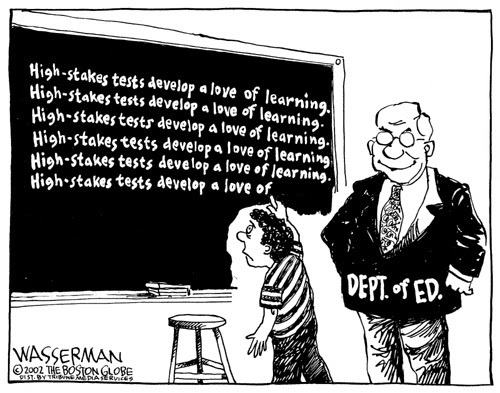 One way is to Opt Out and send the message that high-stakes testing has no place in our public education system. Another way is to join The Network for Public Education in their campaign to ask Congress for hearings into the overuse and abuse of high-stakes testing. "You ask what we can do to turn this around. I am putting my energy into the Network for Public Education, which is working to support candidates willing to defend public education. We are obviously going to be outspent every time, but if we can get people informed and energized, the power of money can be defeated. Students are organizing nationally through a group called Students United for Public Education. The folks at Rethinking Schools do a great job chronicling these issues. And depending on where you are there may be some local or regional grassroots organizing going on. This movement is growing fast." The time is now to take back our public schools and protect them for everyone.